Japanese trade balance deficit is foreseen at ¥600.3B in November, with exports shrinking sharply. Investors could adopt a wait-and-see stance ahead of the Fed's announcement. 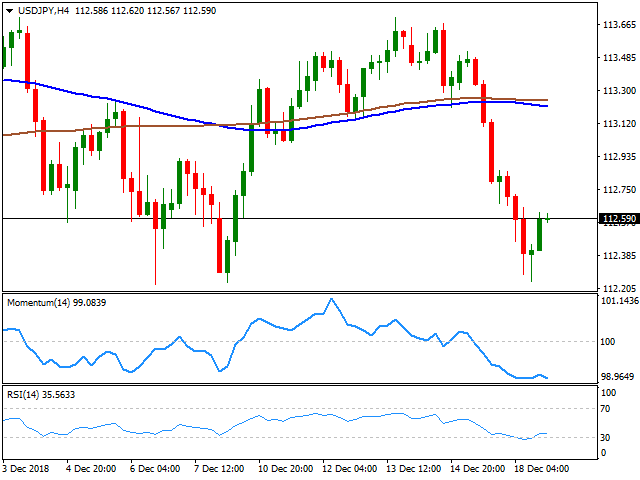 The USD/JPY pair fell to 112.24 as risk aversion dominating markets Monday extended into the Asian and European sessions. The Japanese yen got an additional boost from US Treasury yields, which trimmed all of the last week's gains, with the benchmark for the 10-year Treasury note again at 2.82%. Wall Street's recovery helped the pair bounce back, now trading around 112.60, losing ground for a third consecutive day. Japan will release early Wednesday the November Trade Balance, with analyst anticipating a ¥600.3B deficit amid a sharp decline foreseen in the country's exports. Such outcome, or worse, could end up benefiting the JPY as it will fuel concerns about a global economic slowdown. Could also happen, that USD/JPY traders remain sidelined ahead of the Fed's announcement later in the day, as for sure, will rock bond yields. Ahead of the Asian opening, the pair trades a handful of pips above its 100 DMA, having held above it since last August. Additionally, the pair has bounced several times from the 112.20/30 price zone these last couple of months, making of the level a more relevant support that if broken, could result in a steeper decline. In the 4 hours chart, the pair remains well below its 100 and 200 SMA which gain modest downward strength well above the current level, as technical indicators maintain their bearish strength near oversold readings.